With The End of Average, Todd Rose sets out to reinstate the individual within a crowd of averages. Continuing the conversation started by those like Seth Godin, Yong Zhao and Simon Sinek, it is a book about empowering choice and change from the ground on up. The focus of Rose’s book is on on equal fit, rather than equal opportunity. This all starts with reinstating individuality. To get this message across, the book is split into three parts: the history of the average, the principles of Individuality and individuality in practice. In regards to the history, the story starts with Adolphe Quetelet. Rose discusses how in the 19th century, during the rise of industry and nations, Quetelet set out to develop a science for managing society. Applying the method of averages taken from astronomy, Quetelet worked the vast measurements being gathered by burgeoning nation states to develop a model of the average man. This is where the BMI index stems from. Quetelet’s work inspired many, including Karl Marx work on communism, Florence Nightingale in regards to nursing and Jon Snow in his response to cholera. Another person inspired by Quetelet was Sir Francis Galton. The difference though was that Galton believed that to be average was far from ideal, instead it was mediocre. His interest was on improving on the idea of average. This involved redefining the notion of error, that is the difference from the mean, as rank. All in all Galton identified fourteen different classes, ranging from imbecile to mediocre to imminent. In addition to rank, Galton argued that the best qualities are correlated. For Rose, Quetelet and Galton represent the foundation for the invention of the average. Taking the ideas of rank and average further, Frederick Winslow Taylor used them in the development of scientific management. Rather than empower individuals, Taylor was about maintaining efficiency through standardised processes. In regards to education, Taylor’s ideas were taken up to organise learning through tests, bells, curriculum, textbooks and grading systems. A key figure involved in this movement was Edward Thorndike. A leader in the development of psychometrics, Thorndike saw the ranking of students as a means of measuring innate ability. For to Thorndike, education was about quality over equality. Rose makes the point that this was (and is) not a broken education system, rather a perfected one. For Rose, the heroic history associated with the average came to halt when Peter Molenaar uncovered a flaw in our understanding of averages. For Molenaar, the issue lies with what is described as the ergodic switch. That is, taking something that is non-ergodic and switching it so it is. Using a process of aggregate then analyse, the switch involves understanding individuals without actually recognising their individuality. The problem with this is that group averages are OK if every member is identical and will remain the same in future. This is clearly not the case, for using a group average to discuss individuals treats humans as clones. The answer for Molenaar is the focus on dynamic systems, which are built upon a process of analyse then aggregate. According to Rose, the answer to the end of averages is the rise of individuality. Rather than an equal opportunity, where the goal is to provide everyone with access the same standardised experiences, Rose suggests we need equal fit, where we are all afforded the opportunity for our individuality to flourish. A key to all of this are what Rose describes as the the three principles of individuality: jaggedness, context and pathways. JAGGEDNESS: Moving away from Galton’s one-dimensional view of ability involving correlations, Rose argues that our focus should be distinct jaggedness. As he states, “we can not apply one-dimensional thinking to something that is complex.” Jaggedness involves looking at the various attributes and achievements that make up the whole person. Rose states that there are two conditions for jaggedness: multiple dimensions that are weakly related. What is important about jaggedness is that it is not about finding diamonds in the rough, but instead about finding a way of celebrating true talent. CONTEXT: Essentialist thinking would have it that traits and behaviours can be uncovered through the use of set model, such as the Myer Briggs test or concepts such as introverted and extraverted. These approaches are usually seen as helpful predictors of future actions. The problem is that our character traits are not consistent in all situations. For example, we are all a little bit shy sometime. The question then for Rose is within which context are we shy. Wary of opening a pluralistic Pandora’s box, he suggests that, “we are consistent within a given context.” The challenge is to understand these situations. The strategy that Rose proposes is the notion of ‘if then’ signatures. That is, if it is a particular situation, then it will produce these traits. For myself, an if then signature is exams. I struggle to stay focused in such situations, therefore at University I only chose subjects which involved essays. One of the important things to remember with context is that there is often more to someone than the context at hand. To me, this has many connections with strength-based education. PATHWAYS: One of the legacies to standardisation is that everyone must follow the same set of rules and expectations in order to achieve some sort of mastery. This normative thinking often brings with it such standardisation of time and expectations. The problem with this approach is that it does not work for everyone all of the time, instead it works for a few some of the time. The pathways principle goes against this, instead arguing that there are many ways to reaching the outcome at hand and that the best path is a path just for us. As Rose asserts, “we are always creating our own pathway for the first time.” The only way to judge a pathway is how it fits with our jagged profile and if then signatures. One solution that Rose puts for individual pathways is self-determined competency-based credentialing. An example of this is the work around Open Badges. In their ideal form, pathways break with the analogy tgat success is to climb a ladder, instead it is more akin to a constellation of stars providing for numerous connections. For Rose, the only path to a life of excellence is developing your own individuality, whether it be through your jagged profile, appreciating how you work in different contexts or finding the pathway that is right for you. Maybe it is finding a new solution in business or identifying your own problems to solve, at the heart of the quest for individuality is innovation. Although The End of Average makes a compelling case for change, this comes with its own set of questions and concerns. As a history, it reads as somewhat convenient. It can be easy to be caught up with the narrative of the heroic individual, however the reality is often much more complicated. For example, it is easy to simply associate scientific management with Frederick Taylor, however not only were there others involved in its conception, but it has long been out of fashion. Audrey Watters captures some of these intricacies in her analysis of the factory model of education. Another question left somewhat unanswered is the place of the community. In The Good Education in an Age of Measurement, Gert Biesta argues that there are three ingredients to a ‘Good Education’: qualification, socialisation and subjectification. Although credentials and pathways encompass qualifications and subjectification, there is little discussion of socialisation. In a world which focuses on the individual, it remains uncertain as to how systematic change occurs. Maybe it doesn’t or maybe it is simply industries of individuals working together? Whatever the answer, this is not really addressed. Connected with the question of community, one of the things that stands as a concern for a system built around individuality is that there is a risk that it will only be an equal fit for those with access. Although technology plays a large roll in the form of online learning, it is still dependent on human support. Again such dependency on funding and investment has the risk of reinstating a meritocratic system, especially when the simple answer is to just innovate. Those outside of this opportunity are at then left to the whims of Silicon Valley and the Californian ideology. Relying on such evasive movements as the AltSchool or Bridge International to provide a supposed personalised solution ironically at the expense of our control. I remember when I used to live in the Victorian country side being amazed by the amount of Weeping Willows growing along the open channels that carried water between the various properties. An introduced species, they actually sapped up a lot of the water. I once asked the Outdoor Education teacher I was working alongside why they did not just remove them. He explained that to simply remove them actually causes even more damage through erosion. What is needed, he explained, was to plant something next to the tree that would be able to take its place and fill the same purpose. I see the same thing happening with this book. The End of Average should not be read as a book of answers written to guide teachers and leaders through a new way of being. For that in itself would be the greatest irony, to provide an average answer for a complex problem. Instead, the book starts a conversation. For although Rose identifies the issue at hand, the answers are not necessarily set. Rather it is in part up to us as individuals to work together to move beyond an age of average to something of our own. Beyond Todd Rose’s own website, there is a Wikipedia page with links a numerous reviews. There are a number of videos involving Rose which also provide a useful introduction, including his Ted Talk The Myth of Average, a talk at Google and an eight minute Harvard speech. Karim Derrick has also provided a more thorough breakdown of the history. 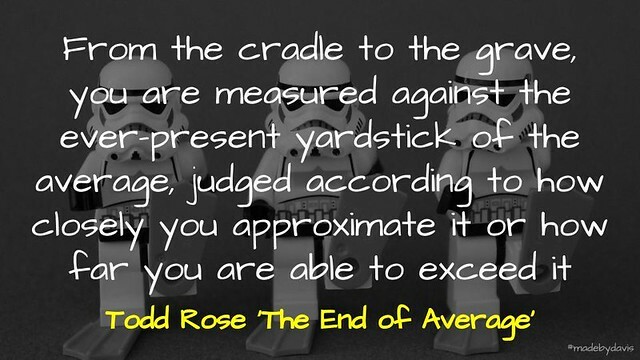 REVIEW: The End of Average by Todd Rose by Aaron Davis is licensed under a Creative Commons Attribution-ShareAlike 4.0 International License. Nicely done, Aaron! 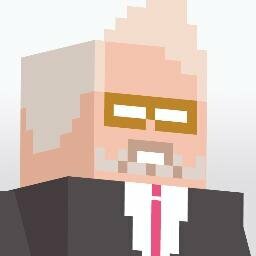 @billselak might like this too. Not yet but I’ve heard good things!